SIG Roofing is supporting 11 apprentices through the Re:allies Framework, an initiative that provides smart procurement to asset management solutions. The efficiencies for social housing projects directly supports people into training and employment in their local communities. SIG Roofing is a specialist merchant of roofing solutions that supplies products through the Re:allies planned maintenance framework to a number of social housing providers across the north of England. It has provided starter toolkits and ongoing training and mentoring to support 11 apprentices as well as sponsoring three of these apprentices who, due to the company’s support, have overcome barriers and now gained employment for construction companies on the Procure Plus Framework. Kieran Stevenson, Samuel Howarth and Megan Boygle have been recruited through Re:vision (a subsidiary charity of Procure Plus Holdings), supported by its partnership with local employment groups in the north: Newground, Achieve and Women and Manual Trades (WaMT). Kieran Stevenson is a roofing apprentice with Connolly Ltd.
Kieran Stevenson is a roofing apprentice with Connolly Ltd working to improve properties for Flintshire Council through the Procure Plus Framework. Kieran had always wanted to be a roofer but struggled to secure a training course due to his dyslexia. Finding school difficult due to his undiagnosed condition of dyslexia, Kieran did not reach his potential. On leaving school he had a few jobs and worked for a construction company gaining some experience of roofing. The work opportunities were inconsistent with long periods of unemployment. He was also involved in a fight during a night out and received a custodial sentence. This made his search for work all the more difficult. Kieran worked closely with Achieve, who supported him in a variety of ways through his rehabilitation, including improving his confidence and practicing interviews. Achieve is a key community partner of Re:vision and were informed of an opportunity which had been identified on a roofing scheme run by Connolly, for which Kieran was suitable. 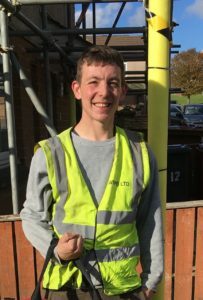 After completing a work trial with Connolly Ltd, Kieran was offered a roofing apprenticeship. Kieran is now at college on block release undertaking the level 2 roofing qualification. Due to the SIG Roofing sponsorship, Kieran continues to do well in his apprenticeship. Both his supervisor at Connolly Ltd and his college tutor are very pleased with his progress and motivation. Kieran receives ongoing mentoring support from the Re:vision team. 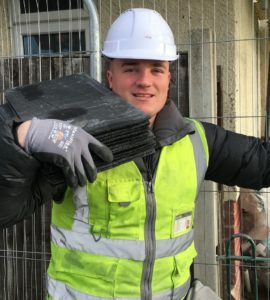 Sam Haworth started his apprenticeship in late 2018 and is working on a Together Housing roofing project in Blackburn. Sam Haworth was introduced to Re:vision by Newground, who have been working with Sam to improve his employability skills. Sam had short-term employment previously but found himself laid off when a contract finished. With previous experience of working in construction and engineering, he was very keen to get back into employment. Following an interview with WRPS, Sam was excited to be given an opportunity to complete a work trial for an apprentice roofer position. During the work trial Sam impressed the site manager with his enthusiasm and commitment. Megan Boygle is working as part of the team from Emanuel Whittaker who are improving the housing stock of Salix Homes. Megan Boygle could not find an apprenticeship opportunity, so went to college hoping that they would help her find an employer while she started training. 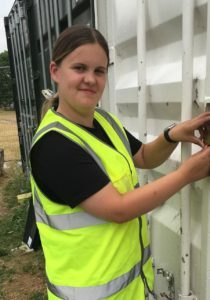 After completing a Carpentry & Joinery Diploma, Megan was still unable to secure an apprenticeship and complete the qualification. The rejections from some companies had a negative effect on her confidence. Megan sought support from the charity Women and Manual Trades (WaMT). WaMT provide advice support and guidance to facilitate the growth in women’s career opportunities within the construction sector, and is a key community partner of Re:vision, working to support both employers and women to make women the norm, rather than the exception, within the construction industry. Re:vision had identified a position on a roofing project in Salford, and WaMT put Megan forward for a joinery apprenticeship with the contractor Emanuel Whittaker. Megan started the apprenticeship opportunity with Emanuel Whittaker in July 2018 and has been working in Salford replacing soffits and facias supplied through SIG. Next : Ashfords LLP advises Wichelstowe joint venture partnership on planning agreement for 3,000 home scheme.